Fiat 500 gains fans and sales in the U.S. The Fiat 500 is winning fans and increasing sales fast in the United States. Maybe it's because of fun ads starring bad boy actor Charlie Sheen and striking Romanian model Catrinel Menghia; or maybe it's because the design and size of the minicar set it apart in the land of beefy pickups, sedans and SUVs. Whatever the reason, the 500 is generating more smiles than an ice cream truck on a hot summer day. I recently got to experience a sampling of America's love for the car while driving the 500 in southwest Florida. Tollbooth operators, who are not known for being overly friendly, were quick to smile and compliment the 500. Parking lot attendants told me how much they liked the car. People walking their dogs waved. Even a kid playing catch with a baseball on his front lawn stopped to stare at the 500 as we cruised past. In nearly a decade of testing cars, I have never experience such an outpouring of unsolicited affection for a new model. 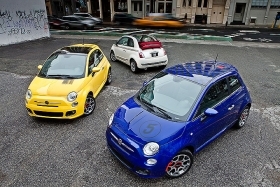 After a rough first year in North America, demand is on the rise for the Fiat 500's 3-car model family. People aren't just gawking at the 500, they are buying it. Fiat sold 8,850 units of the minicar in the first quarter in the United States. Mini sold 10,048 units of its comparably sized Cooper S during the same period. The 500's year-on-year first-quarter U.S. sales were up more than 1,600 percent – a number that is deceivingly high because Fiat was just starting to roll out the car in early 2011. After posting weaker-than-expected North American sales of the 500 in 2011, Fiat seems to be gaining traction with the car. It will take time to determine whether the 500 can match the success of the Mini, which has maintained its strong appeal with U.S. buyers for a decade. The positive reaction I experienced, however, has to provide a little hope and a bit of relief to executives at Fiat's Turin headquarters. They could use the good news especially as they struggle to sell cars in a weak European market.